Young Liam Cabral, aged 10 with his first ever sea bass. The fish weighed approx 6 lbs and nearly pulled him in! Liam is from Canada and loves fishing. 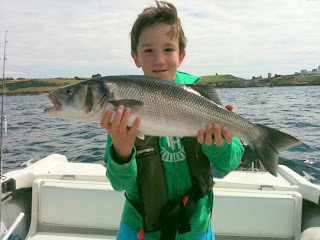 He was out with his father on Richie Ryan's boat Sea Hawk and caught more fish than his dad Dinis!